A new drug has been approved by the FDA for patients with treatment-resistant depression. The drug is called esketamine -- it’s a chemical cousin to an illegal club drug called Special K, otherwise known as ketamine. (WXYZ) — A new drug has been approved by the FDA for patients with treatment-resistant depression. The drug is called esketamine -- it’s a chemical cousin to an illegal club drug called Special K, otherwise known as ketamine. 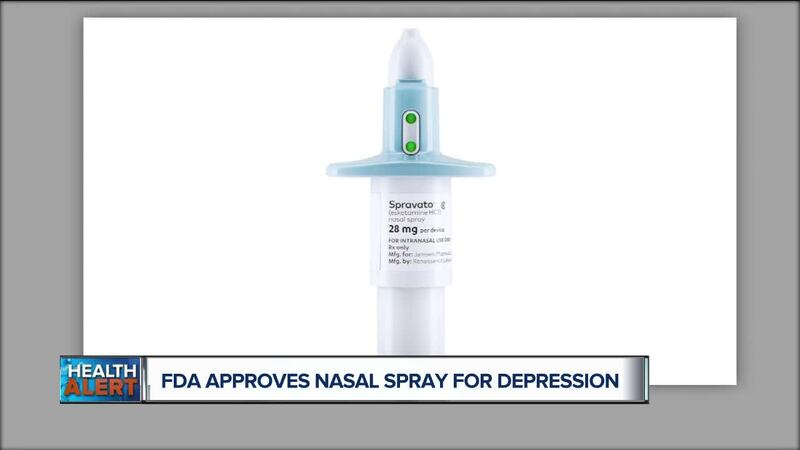 Question: We’ve been told it’s a nasal spray, can you tell us more about this new drug? Well first of all, this new treatment could be a lifesaver for millions of Americans struggling with major depressive disorder, which can be very crippling. Now the drug is going to be sold as Spravato. And yes, it is a nasal spray. The company that makes it says that it likely works by helping to restore connections between brain cells. And it works super fast. In one controlled clinical study, Spravato showed a significant effect on the severity of depression when compared to a placebo. And this effect was seen as early as two days. Surprisingly, some patients even reported feeling better within hours. This is pretty impressive given that antidepressants can take two or more weeks to work. Question: The drug is going to have a black box warning on it, can you explain why? Well as mentioned, it’s a cousin to ketamine, a very powerful anesthetic. So the warning is to let patients know the risks of sedation and adverse outcomes like difficulty with attention, judgment and thinking. They may also have suicidal thoughts and behaviors. And because of these and the possibility of abuse and misuse, Spravato will only be administered in a medical setting under the observation of an approved health care provider. So patients will not be able to take the nasal spray home with them. Now there are other side-effects to be aware of too like dizziness, anxiety, vomiting, increased blood pressure, feeling drunk, and the possibility of feeling "disconnected" from your body and mind. Question: How would a person know if they’d be a candidate for this new drug? When you have treatment-resistant depression, it means that standard treatments are not enough. So you could be a candidate if you have tried at least two other medications that have not really helped. But I’d like to point out that this drug is relatively new, and that means a lot is still unknown about its long-term use. However, for those who have treatment-resistant depression, this drug certainly offers new hope and could be a real game-changer.